Canadian astronaut Chris Hadfield will soon become the first Canadian to command the International Space Station. Hadfield and two other astronauts – Tom Mashburn from the United States and Roman Romanenko from Russia – docked at the ISS on Dec. 21, 2012. Their Soyuz spacecraft was launched from the Baikonur Cosmodrome in Kazakhstan on Dec. 19. It took them two days to reach the space station. The space station is a satellite which orbits the Earth. 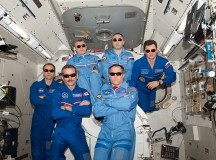 The size of the crew varies from three to six astronauts at a time. The crews stay on the space station for up to six months and then are replaced by other astronauts. Hadfield and his crew will stay for five months. This mission is Hadfield’s third trip into space and his second visit to the space station. When he takes over command of the ISS in March, he will become the first Canadian ever to command a spacecraft. Hadfield can already claim several “firsts” in space. 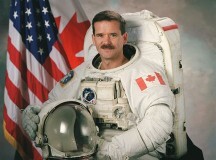 In 1995, Hadfield was the first Canadian to serve as “mission specialist” on a space shuttle. He was also the first Canadian to operate the Canadarm while in orbit, and the first Canadian to board the Russian space station, Mir.